You wanted results? We’ve got ’em! 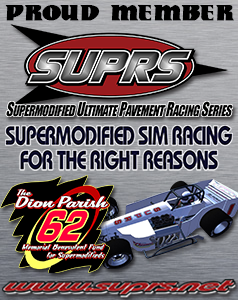 From every supermodified sanction and track across the country. We post the top 3 finishers, car count, and links to the post-race story if we get them. To quickly move to results for each supermodified sanction, simply click the icons below to be moved to the table for each sanction. Once at the results, click the sanction logo again to go to that sanction’s website. All Schedules Subject To Change Without Further Notice. Please call ahead or visit the track’s website by clicking the name of the track in each sanction’s schedule. Results are accurate according to a #WSUCrew member doing live updates at the track, Race Monitor, MyLaps and Speednet, sanction social media posts, and/or website and/or PR sent to us. If we have received a post-race results story it will be linked in the “event” column and you can read all about the race. Note: Strike-through denotes canceled or postponed race. 2015 ISMA SEASON CHAMPION-Jim Bodnar/Dave Shullick, Jr.
2015 ISMA DRIVER of the YEAR-Dave Shullick, Jr.
9.19.15 Race 10 Sandusky Speedway Sandusky, OH 30 Jon Henes Danny Shirey Denny Fisher ? 8.1.15 Race 8 Star Speedway Epping, NH 30 Sparky MacIver Mike Netishen John Lenard ? 9.12.15 Randy Witkum Memorial Star Speedway Epping, NH 50 John Burke Sparky MacIver John Lenard ?